Icey Phoenix that was an entry for #The-Phoenix-Club's seasonal phoenix contest. Started and completed within a day. Wait! 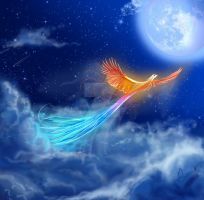 a Phoenix is a Firebird, whats an Ice Bird then! I'm wondering the terms for use. Would this art be able to be used as a background image on a publishing site. It would be part of the background on each author's page to tie in my business name. If its use is possible, is there a fire version of the same, that I would be able to use both, one for each side of the page? Thank you for your time. seminar-reicher.deviantart.com… used without crediting you here. Ghostly, eerie, yet attractively so... I love this piece! A fire phoenix is one thing but an ice one is another and you've done more than an excellent job of bringing one to life in a sense! Very well done, bro! That phoenix is just gorgeous! Very nicely done. This is perfect!!! I've always imagined a Snow/Ice Phoenix & this so beautiful, and fits what I imagined so well! It's simply fantastic & (in my case) inspirational! Great job! It looks so mystical and very beautiful the way you've drawn it. This is so beautiful you did a good job on it. That's a really amazing and beautiful picture, I wish I could draw like that. This picture... is like a dream come true for me. I have ALWAYS pictured a White Phoenix in my head. ALWAYS. And today, I finally see it. 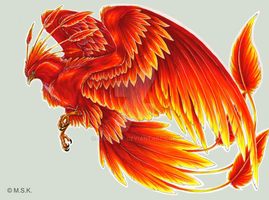 This is the MOST AWESOMEest Phoenix I have ever seen someone drawn. This is perfection, PERFECTION I TELL YE. I am surprised how I didn't notice this earlier, but after seeing it, I couldn't resist but comment. This....is...epic. I want to say a heck lot more but this comment would become too big XD Epic job once again.